Fauzia Minallah is an award-winning Pakistani artist who uses her formidable gifts to help the world’s children know peace. When asked about her hopes and dreams, Fauzia offers a very long list: that girls will be valued as much as boys, that impoverished children have opportunities to read and to create art, that Pakistan will cherish its religious heritage and diversity, that visually-impaired kids will have safe places to play, and that all Pakistani children have access to clean air and water. It’s tempting to wonder how one woman, even one as creative and energetic as Fauzia, might accomplish all that in a single lifetime. She is the first to admit that her work is never finished, but a quick dip into the inspired waters of the Funkor Child Art Center shows how, in little more than a decade, thousands of children have been lifted up and served. Fauzia’s vision began with Amai, an animated bird of light who turns into a shooting star and travels the world. Along the way, Amai encounters children from a variety of cultures and faith traditions. That initial vision expanded rapidly after the 9/11 attacks in the U.S. and America’s subsequent invasion of Afghanistan; Fauzia recognized that she could promote peace and healing through her art. She created a picture book, Amai’s Wish, founded Funkor Child Art Center, and began working with Afghan children in the refugee camps in Islamabad. Since then, she has witnessed the joy, healing, and friendship that art and books bring to children’s lives. Children who belong to Pakistan’s minority religious communities are often members of the under-privileged class. They are marginalized, do not own their own books, and have no access to art. For Fauzia, the situation was ripe for change. The northwest mountains of Pakistan, for example, are home to the Kalasha, a pagan tribe whose practices find their roots in those of ancient Hinduism. 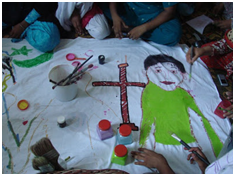 Fauzia brought the supplies the children needed to create beautiful murals as a testament to interfaith harmony. Fauzia also facilitated the creation of a Sikh-Muslim interfaith mural. In early 2009, nearly 500 Sikh families fled Swat and Buner when the Taliban imposed a tax on non-Muslims. They found refuge in the Gurdwara Panja Sahib in Hasanabdal but remained an internally displaced minority community. For this project, Muslim children in Islamabad painted one half of the mural. It was then taken to Hasanabdal where it was completely by the Sikh children in residence there. Minority Christian communities have also benefited from Funkor’s largesse. One event took place at Faiz Church in the urban shanty town known as French Colony. 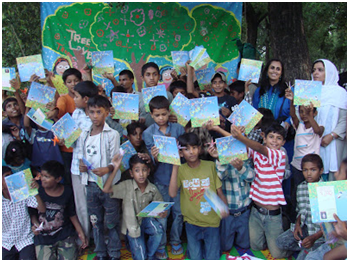 Fauzia distributed 150 books in addition to much-needed food while the kids made paper cranes with Japanese volunteers and painted a mural on Muslim-Christian harmony. On another occasion, gifts were distributed to children participating in an all-church Christian fellowship during the Christmas season. Everyone joined in the caroling, and prayers were answered when the holiday passed peacefully. At the Sarhadi Lutheran Church in Mardan, money was donated to help identify and support host families for displaced Christians and Hindus in the region. Kids were given drawing pads and colored pencils, and a mural was created using outlines of the kids themselves. Fauzia loves the collaboration inherent in the mural-making process, but she recognizes that all forms of art can aid in the healing process. Even when displaced by war or natural disaster, she’s found that kids find joy when folding origami, making paper, or creating up-cycled art with found objects. Young girls can paint images depicting their educational aspirations for an education, and kids in hospitals can draw and share their pictures of hope. Sadako’s Prayer, published in 2006 by the Asian Network of Trust, is another of Fauzia’s ventures. In this book, Amai meets Sadako, a young Japanese girl who is based on the real-life Sadako Sasaki. At the age of 11, she survived the bombing of Hiroshima and serves as a beacon of hope for all children traumatized by conflict or natural disaster. The book has been translated into Japanese and Hindi, distributed to children affected by earthquakes, and translated into Dari for distribution to Afghan school-children. Fauzia’s interfaith efforts come to light most clearly in her book Glimpses into Islamabad’s Soul (Sungi Development Foundation, 2007). Here she documents the rich cultural and natural heritage of Islamabad through her breathtaking photographs of the region. The reader is given virtual tours of Buddhist caves, Hindu temples, and the shrines of Sufi saints; local children light lamps, skip stones, and climb spectacular banyan trees; and Fauzia urges Pakistan’s government to cherish the physical evidence of its past. In 2008, Fauzia helped open Amai Park located on the grounds of the Almaktoom Centre for Visually Impaired Children. As always, children were part of the process. The children who were blind used stencils to paint brightly-colored flowers, even though they could not see the hues. Two years later, Fauzia’s numerous projects merged seamlessly at the first ever National Book Day when two blind children from the Almaktoom Centre read from specially-designed copies of Sadako’s Prayer. One of Fauzia’s most ambitious projects is about a mural on the “Indus Heritage.” It began in Islamabad with teenaged artists who took their unfinished work to New Delhi, where Hindu students finished it with them. The story of this amazing artists’ peacemaking journey is told in the video on the right. All this amazing work began as a little bird that emerged in the imagination of an incredibly talented and generous woman. Amai is a bird of peace, a bird of interfaith harmony, and a bird that unites people through art. Together, Fauzia and Amai continue to share their vision, allowing it to resonate gracefully and joyfully in the lives of the world’s children. The photographs for this article come courtesy of the Funkor Child Art Center.